During the past two years, Rogét Chahayed has emerged as a successful songwriter & producer who’s had three hits on the pop chart. In 2016, he co-wrote the Top 5 hit “Broccoli” for rapper DRAM (featuring Lil Yachty). Then in 2017, he co-wrote two more singles that are currently moving up the Billboard Hot 100 chart: “Bad At Love” by Halsey and “Sky Walker” by Miguel (featuring Travis Scott). Interestingly, Chahayed has a background as a classically-trained pianist who studied at the San Francisco Conservatory of Music. He studied and performed both classical and jazz music there, while also developing his skills in the pop and hip-hop genres. 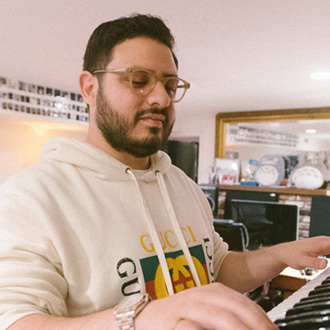 In addition to the artists listed above, Chahayed has worked with Bruno Mars, Kendrick Lamar, Calvin Harris, Travis Mills, Dr. Dre, Solange Knowles, A$AP Rocky, A$AP Ferg and J Balvin. We are pleased to do this Q&A interview with Rogét Chahayed. He tells how he got started as a pianist, and later became interested in pop and hip-hop. He also tells how he co-wrote his hits with DRAM, Halsey and Miguel. DK: Where are you from, and how did you get started as a musician? Rogét Chahayed: I was born and raised in West Hills, California, which is a suburb of Los Angeles. My dad grew up singing and playing percussion, and always loved music. When I was 7, he surprised me when he came home and brought a piano, and he signed me up for piano lessons. I began playing piano at a young age, studying classical music and playing recitals. DK: I noticed you have a website that focuses on your classical piano playing and composing. Do you still work with classical music? Chahayed: Not much anymore. I had that website before I really got into (pop) production and songwriting. I went to college at the San Francisco Conservatory of Music and studied classical piano there. So when I graduated, I came back to L.A. and began teaching piano lessons and playing jazz gigs and things like that. But I still do practice from time to time and perform my classical repertoire, just to keep my technique fresh, and extract ideas—harmonic and chordal ideas—and bring them to life in my own way. DK: How did you go from being a classical and jazz pianist, to being a writer/producer doing pop and hip-hop? Chahayed: It mainly happened during college. I was practicing 4 to 6 hours per day, preparing tough concert pieces. But in the midst of that, I had friends from school, and they exposed me to hip-hop and a lot of great artists and songs. Also, I remember that a friend had shown me some stuff by Dr. Dre, and how [he knew someone] who played keyboards and did production with Dre and other great artists. So when I heard about this, it kind of changed my direction of what I wanted to do. DK: When you started doing pop and hip-hop, was there a specific opportunity you had, that took you to the next level as a songwriter and producer? Chahayed: Well yes, I think it was back in 2013. I’d met a singer, and I worked with her on her EP and songs. She introduced me to her husband, who’s a rapper named Stat Quo who used to be signed to Dr. Dre’s label. He really liked the work I was doing, so he said, “I want to introduce you to some people.” He then introduced me to a producer named Mel-Man who worked with Dr. Dre for a long time. I began working with Mel-Man, and he was like a mentor to me. So I was making beats with him, and he would show me the ropes of hip-hop. And along the way, he introduced me to Dr. Dre, and I ended up working for Dre in 2014 as a keys player and producer. [These collaborations] definitely changed my life and shaped how I worked on hip-hop and producing. DK: Two years ago, you had a big hit with “Broccoli” by DRAM (feat. Lil Yachty). How did you hook up with DRAM and Lil Yachty for this song? Chahayed: Well, I produced DRAM in 2016 with a friend Imad Royal, who’s also an amazing producer and artist. At the time, Imad was working with DRAM and he said to me, “Hey, do you want to come to the studio to work with us?” And I said, “Yeah” (laughs). DRAM and I clicked instantly, and we became partners (in the studio). A few weeks after we started working together, DRAM and me were finishing up a session, and Lil Yachty came by. DRAM had invited Lil Yachty to the studio. I turned my keyboard back on, and I told the engineer to give me a few sounds while I was kind of plunking the keys. [The engineer] got the sound on, and the first thing that came out were those chords. So once we did the chords and put on the drums, then DRAM sang the melody that became the flute line in the hook. After that, the beat was wrapped up in about 10 minutes. Then Lil Yachty and DRAM did their thing and came up with the rap. And we kind of were looking at each other like this is definitely something cool (laughs). DK: Was it DRAM who came up with the catchy title, “Broccoli”? Chahayed: Yeah, it was him…I was sitting there when he named it. We were saying, “What do you want to call it?” And he said, “Hey, we’re gonna call this Broccoli!” (laughs). DK: When you’re in the studio writing with the artist, what’s your strength? Is it the keyboards and tracks, or do you also do topline (lyrics and melody)? Chahayed: Well naturally, playing keys and chord progressions is kind of my specialty. I always like to start the vibe organically by finding an interesting sound, and then combining that with a chord progression to set the vibe for the artist. But you know, I also like to act as a sounding board for melodies and lyrics. I love when people bounce ideas off of me, and giving them feedback. But I would say that the music and the production is my specialty. DK: You have a new hit with Halsey, “Bad At Love.” How did you connect with Halsey and write this song? Chahayed: The story behind this song, is that I was working with a fantastic producer, Ricky Reed. It was just a regular day in the studio—Ricky and I were working on some ideas, and we built the track together. I layered all the keys and synths, and he had taken that particular idea and took it to his session with Halsey. I had worked with Ricky and gave him the loop, and several months later I got a phone call saying, “Hey, one of the things you did with Ricky turned into a song for Halsey.” And that was that. DK: That must have been nice, getting that phone call. Chahayed: It was a very nice phone call indeed (laughs). DK: You have another single on the charts, “Sky Walker” by Miguel. How did you hook up with Miguel on that song? Chahayed: Well it’s actually funny, because I was working with another great producer, Happy Perez. I’d been finishing up a session with Happy, and he had me leave some extra ideas at the end. He took one of my loops and gave it to Miguel, and they made “Sky Walker.” I’ve also worked with Miguel several times—he’s a really great guy and an awesome producer and artist as well. DK: Besides these two current singles, do you have other upcoming cuts coming out that you’re excited about? Chahayed: There’s definitely a few things coming out, but I don’t know if I can talk about it yet (laughs). But I’m really excited about the artists I’ve been working with lately.